2017 G6 LG MWC LG G6 is official! I'm actually very excited about this. I've been a long time LG fan. Ever since the Nexus 4 (/ Optimus G), it was great. The next year, the G2 was even better. I think it really hit its stride with the G3 and well, I loved the G4. We'll try not to think about the G5 ... even though it's right here next to me. Many people consider it a flop, but the phone is solid, it's just the 'friends' aspect that didn't really catch on. Anyhow, what's been interesting to note is that ever since the G the devices have been coming out on a less than one year cycle. The original Optimus G came out around late October. And then 6 iterations later it's coming out early spring. Just something I've noticed. To me, it says that people are clamoring for it (or is it they want to release with MWC?). So, what is going on with the new version? There's lots. We've talked about a few of them already, but let's go through the official version. By tonight, I'll have had some time with the device and hope to write up something a little more 'hands-on'-y for y'all. Let's unpack a little there. It doesn't look so 'impressive' but let's really dig in. This is the major differentiator from anything else out there (really, I think LG does take the cake in terms of innovation for their products). The first thing is that this is the first device that's a 18:9 (or 2:1) ratio. The advantage here is that not only is it for those ultrawide movies out there, but they can actually make a 5.7" device in about the same housing as a 5.5" that is 16:9. Pretty smart. The other thing is that there's rounded edges to the display. Word is that this is there to help protect the corners of the device from getting too banged up. Lastly, the device has HDR10 and Dolby Vision ratings so that when you watch something with some real depth to the colours and display, this is capable. I wonder how it'll hold up to every day usage tho'? Okay, some are upset that they only upgraded the processor from the 820 to the 821. Well, I think there's a bit of 'Samusng" on this as the rumour is that the company wanted the 835 exclusive. Would we be able to tell the difference from the 835 and the 821? Probably not. Also, there's not much more bang with the RAM, staying at 4GB and not going to 6, which I'm okay. The plucky G5 just zips along without any issue. Staying with 32GB will be my issue. I wish we got the 64GB the Korean markets were getting. I'm okay with 32... just like the future option if I needed more that I wouldn't have to rely on an SD card. Like its predecessor the phone comes with 2 different lenses on the back. Now, the upshot is that this year they're both the same resolution, but it comes at a price of being only 13MP. Now, last year it was 16/8, but they're saying that the lower resolution (which will still be some pretty wicked shots, I'm sure) allowed it to not have a camera bump. Some neat things that this has that I want to check out is that you can shoot in square (not a new thing tho') and with the 2:1 ratio, you can see a previous shot while taking the new. Apparently there's even a 'line up' feature where you can line up a previous shot with your current one so that you can ensure you get the right composition. Cool. Woot... bigger screen, means bigger battery. 3300mAh should last a long time. Now, they mention that the US version will get wireless charging (neat that it's BOTH Qi and PMA), but does that mean it'll come to Canada? There was quite the debacle in years past about that. This is going to be a favourite of mine. Being able to use it while it's drizzling outside will be pretty important for me. So, not only is it coming with 7.0 out of the box (and it works quite well with my G5) ... it will come with Assistant. Sure, they just announced that most phones with 6.0+ will get Assistant in the coming weeks (not holding my breath there Google) it will have it out of the box and LG developed the phone with it in mind (I wonder if it's taking the place of that smart assistance feature they had). So, there's many neat little things in this device that packs it all into a nice phone for an overall great experience. Again, I'm hoping to have some one-on-one time with the puppy tonight and will let you know more of my thoughts after that. We are under the impression that this will be arriving around April of 2017, but no prices are discussed as of yet. How excited are you for this? 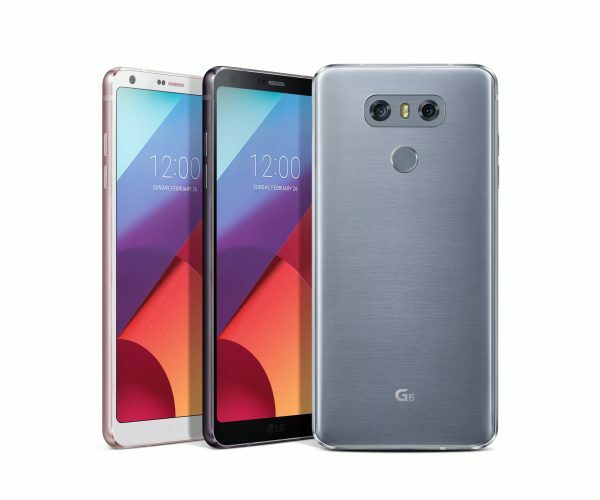 TORONTO, Feb. 26, 2017 — LG Electronics (LG) unveiled the G6 smartphone today, the newest smartphone that features a bold new display format complimented by a cinematic viewing experience, exceptional screen to body ratio, wide angle camera and more. Designed in response to consumer feedback and user opinions, the G6 is a back-to-basics approach to premium smartphones, with a focus on the features consumers want, most notably a big screen that actually fits in one hand. The LG G6 comes with a 5.7-inch QHD+ (2,880 x 1,440 resolution) FullVision display, and for the first time ever in a smartphone, an 18:9 screen aspect ratio. Compared to conventional 16:9 aspect ratio displays, the 18:9 aspect ratio offers more viewing space and a more immersive experience when streaming videos and playing games. The LG G6 can also take perfectly square photos in 1:1 ratio, ideal for Instagram, Snapchat and other social media apps. Users can also choose other ratios, such as 4:3, 16:9 and 18:9. Even with the large screen featured on the G6, the smartphone is easy to hold. And unlike other phones with a similar screen size, the LG G6 fits comfortably in one hand, giving you a big screen experience without the inconvenience of a big phone. In fact, ergonomics research teams led by Dr. Andris Freivalds at Pennsylvania State University and Dr. Ji Yong-gu at Yonsei University tested the LG G6 for stability when holding the phone, comfort in various postures and actions, as well as muscle fatigue when using the smartphone for long periods. The LG G6 received the highest marks in all test categories. Sculpted from aluminum and glass, which comes in platinum and black, the LG G6 features a minimalist design that’s sleek all-round and perfectly smooth to the touch. The metal frame that wraps around the perimeter of the phone imparts solidity in style with a soft matte finish and the back is perfectly flat, with no camera bump to avoid or protect. Complimented by narrow bezels, the upper bezel was minimized by rearranging the camera, sensor and speaker in a row on the front upper side. The rounded corners of both the body and display not only unify the design but also dispersing the impact if the phone is dropped. The LG G6 is the first smartphone to feature Dolby Vision technology. But not only does it support Dolby Vision, the G6 also supports HDR 10, both of which are standards for High Dynamic Range (HDR), the picture quality technology which allows for a wider range of color and luminosity, wherein both the darkest and the brightest areas are more vivid, revealing greater detail for a truly immersive viewing experience. With smartphone screen sizes getting bigger and the speed of the Internet becoming faster, LG decided to support two HDR standards for viewers to have access to as much content as possible. With HDR content from Netflix and Amazon on the rise, watch popular shows in stun-ning HDR quality on the LG G6. Amazon will also increasingly create 18:9 content for a cinematic viewing experience on the 18:9 QHD+ display. With the LG G6, you don’t need to ask people in the picture to reposition, cram together or find another place to stand in order to get everything in, simply choose between standard and wide angle settings. And with dual 13MP rear cameras, including a 125-degree lens on the wide angle, the LG G6 captures panoramic shots that regular phones cameras can’t. The G6 delivers an outstanding and unique camera experience by creating seamless tran-sitions when zooming in and out between the wide-angle and standard camera lenses even during 4K video capture. The G6 also comes with an expanded 100-degree field of view with its 5MP front camera, which means users can take selfies or wefies without the need for a selfie stick. Plus, the wide angle camera reduces edge distortion, which makes for more natural images. And to view selfies, wefies, wide angle pictures and even the ones in the new Square Camera Mode, recent LG G6 photos appear in one window in film mode which means users don’t need to move to their gallery to review them. The G6 provides a Square Camera function which divides the 18:9 ratio display into two identical squares. Users can take pictures in 1:1 ratio in one window, while checking, editing and uploading pictures in another window immediately after shooting. What’s more, users can create GIFs by combining between 2 and 100 photos from the gallery. The LG G6 can be taken just about anywhere without worry thanks to its IP68 water and dust resistance that makes it is fully dustproof and safe to be immersed in up to 1.5 metres of water for as long as 30 minutes. And you can worry less about accidental drops and other rough environments during everyday use because the LG G6 has been designed and built to be dependable even when the going gets rough. The G6 passed 14 different military-standard 810G tests. And the LG G6 not only meets international testing standards but also endures further tests for high temperatures and nail penetration and uses a proprietary technology that dissipates heat via an internal heat pipe, the first in an LG smartphone. And to further disperse heat inside the unit, LG engineers positioned the components most prone to overheating as far from each other as possible. The LG G6 has Google Assistant built-in. LG worked closely with Google to make sure the Google Assistant experience is great right out of the box and that’s why the LG G6 has Google Assistant built-in. It works seamlessly and intuitively with LG apps, empowering users to get fast answers, manage everyday tasks, enjoy the best music and videos and search the G6 more quickly and efficiently than ever. And with the remote after-service utilizing artificial intelligence, the more Google Assistant is used, the more personalized it becomes because it knows more about the user.